In CURE FOR THE COMMON BREAKUP, you won’t be short on laughter, romance, or drama. All these make for a perfect book for you to tuck into your pool or beach bag this summer. Summer Benson has the perfect life as a flight attendant. She can tour the world, live it up it in all the great cities, and fly to all the romantic cities with her handsome, pilot boyfriend. On a flight to Paris, Summer realizes Aaron plans to propose, but their future is halted by a disaster. Summer has nowhere to go and no family to take care of her, so she goes where a magazine article leads her….Black Dog Bay, Delaware. Black Dog Bay has gotten its notoriety being the place women and men go when they need to get over a bad break-up. Marla at the Better Off Bed-And-Breakfast plays hard ball with cell phones and desperate phone calls and texts. Jenna at the Whinery makes a mean “Cure for the Common Breakup” drink and the bonus is that the recipe is included in the book. Hattie, the matriarch of Black Dog Bay is a force to reckon with and gives Summer a lot to think about. Of course, there has to be a male interest in the story, and Dutch Jansen plays that part well. He is the Mayor of Black Dog Bay and has a history that will impact everyone who lives there. Beth Kendrick has written a fun, light-hearted, romantic, and hilarious novel that will be perfect for your summer beach read. Summer is sassy, spunky, and snarky and will no doubt keep you on your toes and keep you laughing. I loved all the characters and their role in Summer’s healing. An example of the great characters in the book and the scene Kendrick places you in is when Summer arrives at the Better Off Bed-And-Breakfast. Marla proceeds to take her cell phone right away as part of the requirement for staying there. Summer asks,”So this is like breakup boot camp?” Marla states, “Mm-hmmm. With homemade blueberry muffins for breakfast.” There were so many great lines in the book that I couldn’t possible write them all here, but you will want to remember some of the one-liners for your next drama filled situation. What I liked about the story and the premise for Black Dog Bay is that is wasn’t about getting revenge or being nasty, but about letting go and finding a new direction in your life and starting over. All of the characters had to do that at some point in their life and I think the reader can relate to one, if not many, of the characters in the book. I could have used a hide-away like this at a point in my life to reflect and rejuvenate and get some of my sass back. The cover is definitely eye-catching, fun and scored big points with me. Seeing this on the shelf among other books will definitely draw your eye and make you pick up the book. I also appreciated that there wasn’t graphic details in the romance department. It left the imagination up to the reader which was just fine with me. 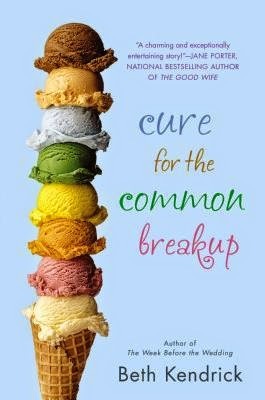 Pick up CURE FOR THE COMMON BREAKUP for a story full of sassy ladies that will rally around their new friend to give her a future she only dreamed she could have. Beth Kendrick is the author of THE WEEK BEFORE THE WEDDING, THE LUCKY DOG MATCHMAKING SERVICE, AND NEARLYWEDS, which was turned into a Hallmark Channel original movie. Although she lives in Arizona, she loves to vacation at the Delaware shore, where she brakes for turtles, eats boardwalk fries, and wishes that the Whinery really existed. 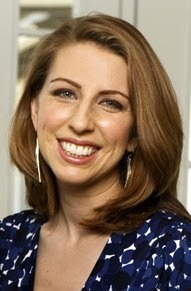 For more on Beth, visit her website at http://bethkendrick.com/. You can also find her on Facebook, HERE and Twitter,HERE. I received a copy of this book for review from Penguin Group. This review is my honest opinion. I was not compensated in any way for this review. If you choose to purchase the book through the above link, I may receive a small compensation. Thanks for supporting SincerelyStacie.com reviews. Sounds like a fun summer read! I'll check it out!